Florida vs. Nevada: Which Blew the Bigger Bubble? That's Maurice. He'll be guarding our front door this evening. The rules are fairly simple. There's no reason for concern as long as everyone keeps their wits about them. Damage From Sandy? What About Potential Economic Boost? I propose that the Lernaean Hydra should become our new National Emblem. For every dollar of wealth that's destroyed, four to six more will take their place! In Greek mythology, the Lernaean Hydra (Ancient Greek: Λερναία Ὕδρα) was an ancient nameless serpent-like chthonic water beast, with reptilian traits (as its name evinces), that possessed many heads — the poets mention more heads than the vase-painters could paint, and for each head cut off it grew two more — and poisonous breath so virulent even her tracks were deadly. 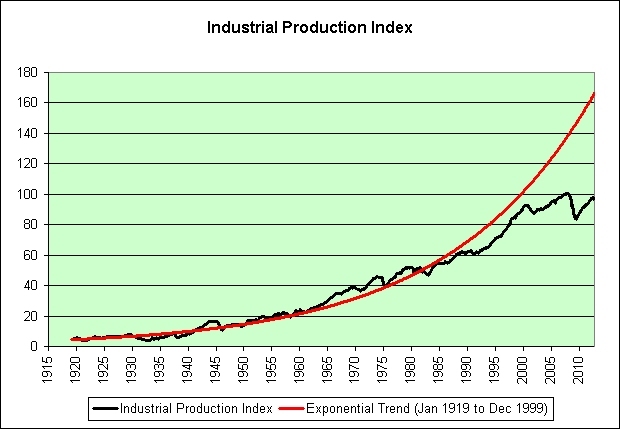 It's the prosperity of wealth destruction. How can we get more of it? We need a Department of Homeland Insecurity. We desperately need to come up with a new technology that will guide more hurricanes TO our shores and AWAY from the shores of those we compete with. We also need to act quickly before the rest of the world catches wind of our plan. Marketwatch, a WSJ web site, has sunk to the lowest awful denominator in headline writing. The formula seems to be "5 ways/secrets/moves BLANK is playing EVENT now" OR "How a bull/bear/trader is reacting to EVENT". 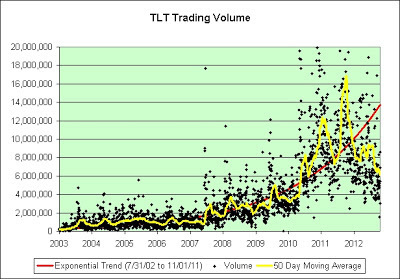 The key is to motivate pure speculation based on how other speculators are speculating right now. This reminds me of an article I was going to heckle a few days ago but other things came up. Note that the following link very nearly fits his template. Excellent! The BLANK is [Stagflationary Mark]! The EVENT is [his own treasury ignorance]! 10 Surprising Ways Stagflationary Mark Is Playing His Own Treasury Ignorance! Yes! Fantastic! Let's see what I say, shall we? 1. Treasury bills are shorter-term investments. They come with maturation rates from a few days to one year (52 weeks). They are sold at a discount, or coupon, of 1% off face value; when the bill matures, the seller receives the interest rate and the principal in the form of the face value. I can't believe I said that. This REALLY surprises me. Why? They are NOT sold at a fixed 1% off face value. As seen here, it would have cost us $99.989889 to buy 11-01-2012's 4-week treasury bill. That's right. The government gets to keep $99.99 of our money for 4 weeks and all we get is a penny for our trouble (to bring us to $100 of face value). That's 100x less than the article claims. If that's how I am supposed to be playing treasuries, then I sure am ignorant! Well done! 5. As investments go, they're safe. "They are widely considered to be a risk-free asset on the shorter maturities," Hill said. "Interest rate volatility won't affect them." I can't believe I said that. Seriously? 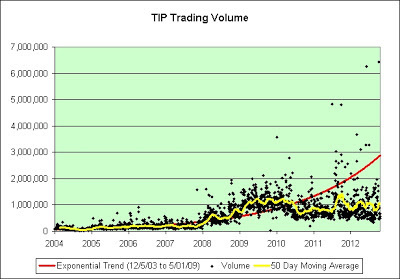 While it is true that I think TIPS may be safer than many investments, I don't remember claiming they were safe. If a tire leaked 1.37% of its air for every mile we drive, would we call it safe? 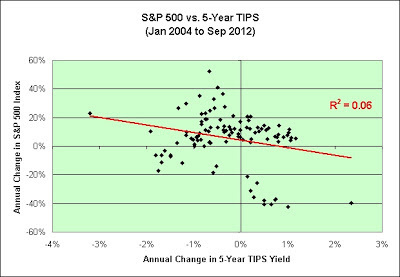 5-Year TIPS currently yielding -1.37% leak 1.37% of their purchasing power each and every year. How is that safe? I should also mention that we have to pay tax on the inflationary gains too. Where's that money supposed to come from? Some other risk-free asset yet to be determined? This article sure doesn't seem to know me. I don't get it. It specifically says "You" right in its title. Am I not me? It's certainly a conundrum! Or is it? If I can't figure it out, then that can mean only one thing. Genius! It really is surprising! Be sure to check out the EIGHT other surprising facts about treasuries. They're right up there with finding Jimmy Hoffa buried in a bank vault, lol. Some people just don't know when to give up. First he picked on my beloved potatoes and now he's going after my beloved chicken. It's getting personal! Hahaha! I'm pointing this out for those who still think that the typical American consumer is paying $1.30 to buy a pound of potatoes and that potato prices are up 306% since 2008. 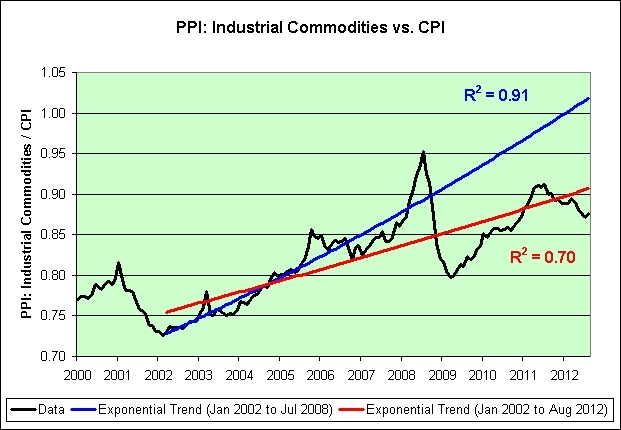 The professor no longer claims that potato prices are up 306% since 2008. We've made some progress on that front, lol. Forehead. Desk. Whack. Whack. Whack. However, he still claims the following. But what HAVE seen is that food and gasoline prices have skyrocketed since December 2008, particularly relative to the Consumer Price Index less food & energy. He's decided to go after meats, poultry, fish, and eggs prices. Did he stick with the December 2008 cherry picked starting date from his original post? No. That date no longer worked for his new charts. He's decided to cherry pick a whole new starting date instead. This time it is the middle of 2010. 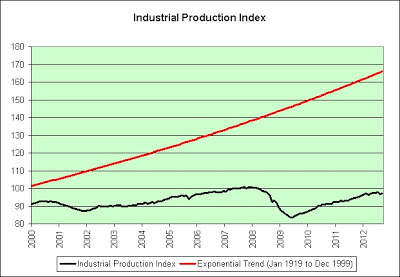 Want to know why the middle of 2010 is so important? 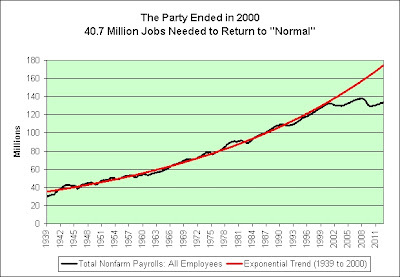 I think it is fairly clear when you see the the complete chart going all the way back to December of 2008. Oh, look. He's conveniently ignored the deflationary food price data from early 2009 to early 2010. Ignoring that data allows him to make the following claim in the comments of his post as if it is gospel. No potato data, but food still rose 3x faster than “inflation” and gasoline has grown incredibly. Here is the data that we're both using. 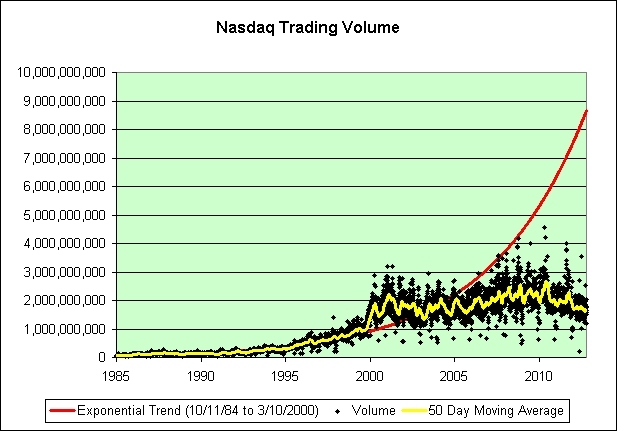 Here is a link to the chart above. 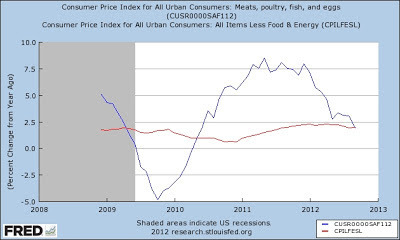 The Consumer Price Index for All Urban Consumers: Meats, poultry, fish, and eggs was 208.966 in December of 2008. The Consumer Price Index for All Urban Consumers: Meats, poultry, fish, and eggs was 230.690 in September of 2012. That's a 10.4% increase over 3.75 years. The average increase per year was therefore a relatively tame 2.7% (1.104^(1/3.75) = 1.027). It's a bit higher than overall inflation but hardly enough to claim that these foods have "skyrocketed" since December of 2008. The data clearly shows they did not. I can say from personal experience that I have seen meat prices increase a bit faster than overall inflation over the years but it has been somewhat offset by extremely stable poultry prices. It's been a very long time since I've seen boneless skinless chicken prices rise at Costco. What can I say? I love chicken almost as much as I love potatoes. I tend to notice these things. And lastly, there actually is potato data if the professor cares to look. It can be found within the Bureau of Labor Statistics CPI database. I really don't think it supports his case though. 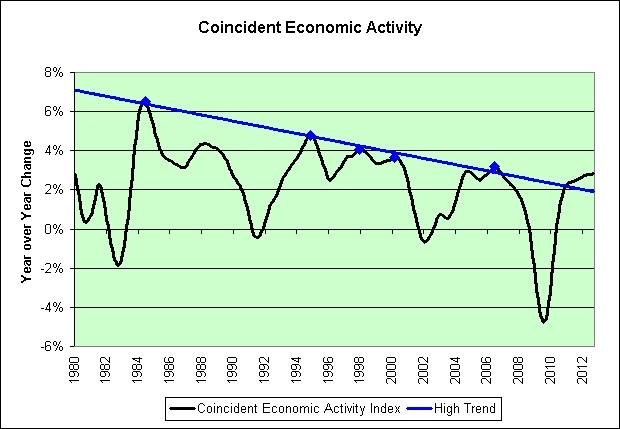 The consumer price index for potatoes was 353.564 in December of 2008. The consumer price index for potatoes was 301.302 in September of 2012. That's a 15% drop in price. This is in sharp contrast to the professor's original claim of a 306% price increase over the period. As I type this, Safeway is still offering 5 pounds of Russett potatoes for $1. No joke. 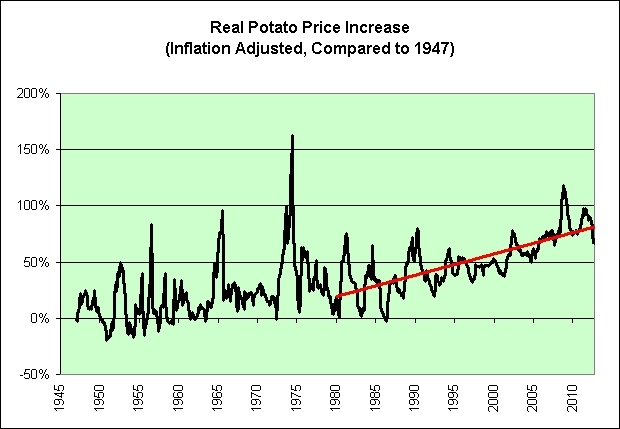 As I have previously stated, potato prices have generally risen faster than inflation overall. 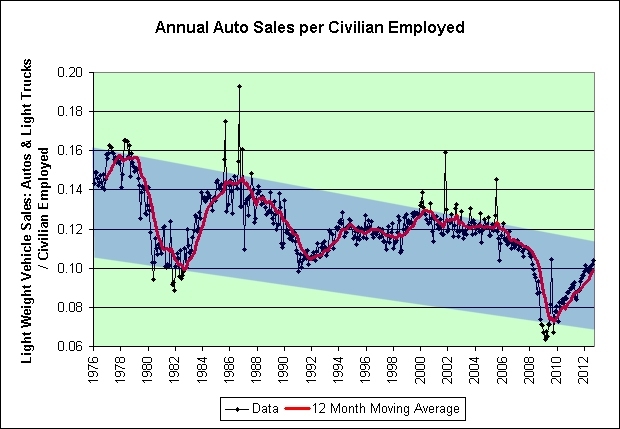 One exception is the very time period that the professor claims they skyrocketed. Go frickin' figure. It could have been an honest mistake and one that could have been fixed, but this new shift to the middle of 2010 to support a claim going back to December of 2008 takes a serious amount of cherry picking balls. Kudos to you Professor Anthony B. Sanders of George Mason University. You definitely deserve a food-based award. I'd say we're pretty much failing on all fronts. 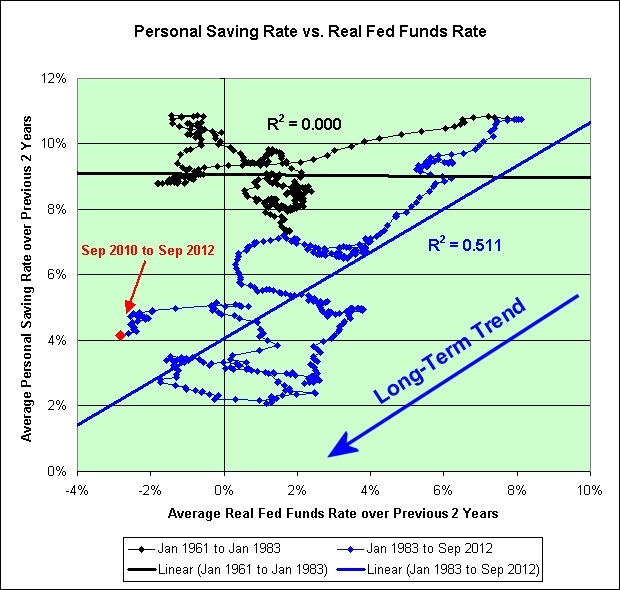 Note that there doesn't seem to be any correlation between the personal saving rate and the inflation adjusted fed funds rate until the early 1980s. The Federal Reserve sure has convinced us to take big risks with our savings since then though. I wonder what did it? Here's the crazy part to me. 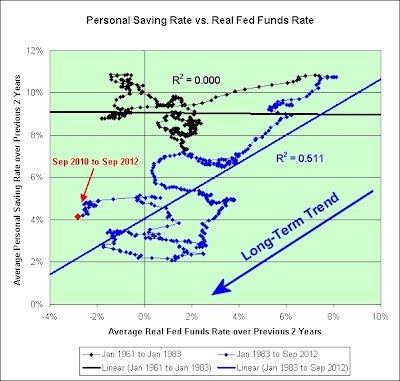 As a saver, I tend to save more when interest rates are lower because my savings can't grow as much. I therefore need to save more in order to compensate. That means fewer trips to the malls and less money to spend on discretionary items. Of course, there might be another way to look at it. If the rich don't save because they already have more than they know what to do with, the middle class don't save because they've been convinced that the stock market is a "sure thing" over the long-term, and the poor can't save because they are living paycheck to paycheck, then who exactly will save? I guess it is up to me, lol. Sigh. As of 2004, I am a permabear. Sigh. 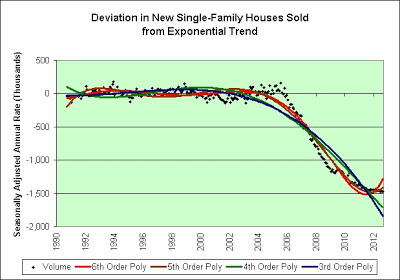 All exponential trends eventually fail. This one is no exception. 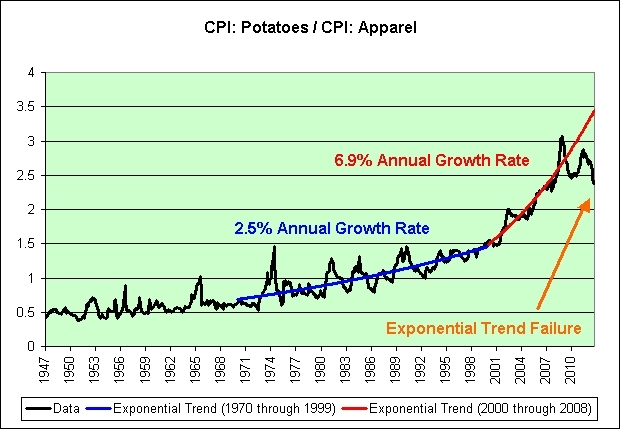 Real apparel prices (inflation adjusted) have seemingly stopped their downward spiral at about the same time real potato prices have seemingly stopped their upward advance. 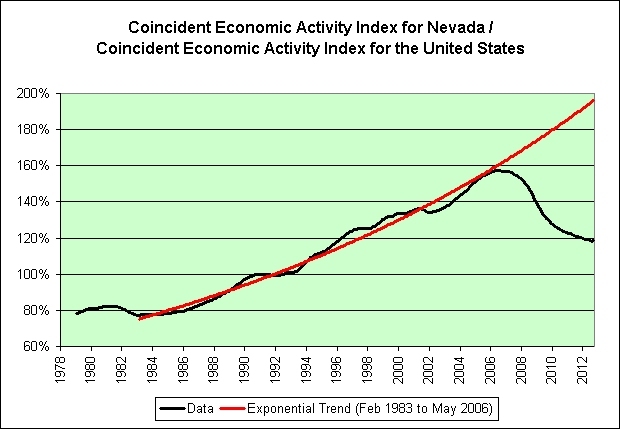 Also note that this chart has been relatively flat over the past 5 years (we're no longer on the exponential trend line in red). Coincidence? 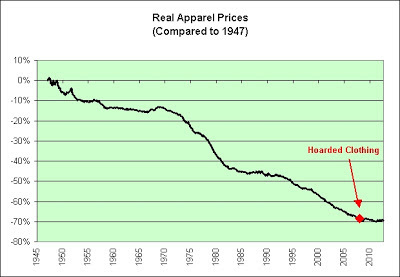 This is great news for those of us who have hoarded apparel in recent years. It is also great news for those who couldn't figure out a way to hoard potatoes long-term. 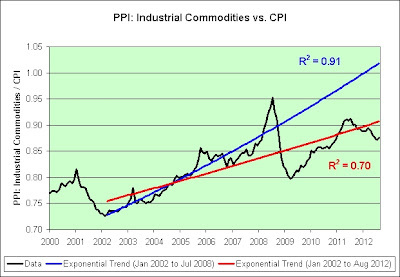 In all seriousness, I look at this chart and wonder if the Commodity ‘Super Cycle’ May Be Coming to End. It doesn't help that I'm not bullish on China, nor have I been since 2007. This is the part that I find most interesting. Perhaps it was not a coincidence. As real apparel prices fell, something else (like potatoes) had to go up in order for our central bank to meet its 2% inflation target. So what happens to the real price of other things if real apparel prices can no longer fall? Perhaps they can't go up. It's a rather simplistic question and the answer is simplistic too. Of course, that doesn't mean it isn't right. Who can say for sure? In any event, I am definitely not in the hyperinflation camp (at least not anytime soon). Just something to think about. This is not investment advice. $1 gets you a "5-lb. Bag of Russett Potatoes" this week at Safeway. Last week, $1.99 got you a 10 pound bag at the same grocery chain. 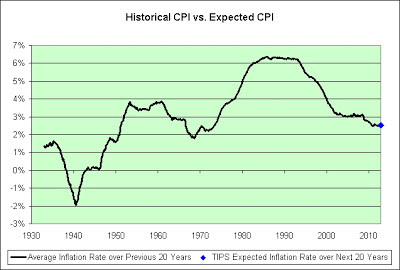 In general, potato prices have risen faster than overall inflation since the 1980s (as seen in the following chart). 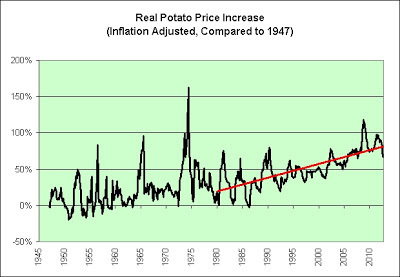 I take serious exception to the claim that potato prices have exploded higher in the last few years though. I see no evidence of that at the Bureau of Labor and Statistics (BLS), I see no evidence of that in my own purchases, and I see no evidence of that in regard to the prices received by Idaho's farmers. In 2011 Idaho farmers planted 320,000 acres of potatoes. The average yield was 398 hundredweight per acre. The average price paid to growers was $7.70 per hundredweight and the total value of production was $978.4 million. Idaho farmers received 7.7 cents per pound for potatoes in 2011. If you are paying $1.30 per pound at the grocery store, then perhaps you should shop around more. Potatoes: The potato crop in 2012 is expected to expand by close to 7 percent from 429.6 million hundredweight (cwt) in 2011 to 459 million cwt. Through July, freshmarket potato prices are down approximately $2.75 per cwt from 2011 values, whereas processing prices show slight gains. Those betting on potato hyperinflation must be severely disappointed right about now. Fortunately, I'm not one of them. What can I say? I love cheap potatoes. The red trend line continues to drift away. 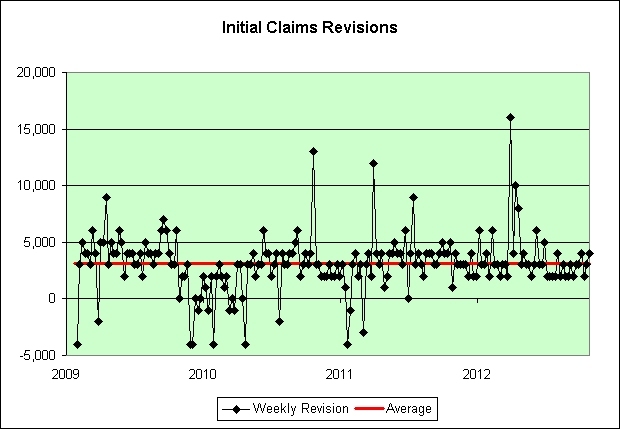 Speaking of Kahn, the previous week's initial claims were revised up yet again. That's 67 upward revisions in a row. I'm not arguing that this is all part of a grand conspiracy, but at some point you've got to think the DOL's estimation model could use a reality adjustment. Just sayin'. At some point along the way I lost track of the count. It is actually 69 straight revisions. I am updating previous posts to reflect this. OMAHA, Neb. — Billionaire investor Warren Buffett said Wednesday that the global economy is definitely slowing because of continued problems in Europe and the decline in Asia. But he said that the U.S. economy is still improving modestly and business will improve regardless of who wins the presidential election. 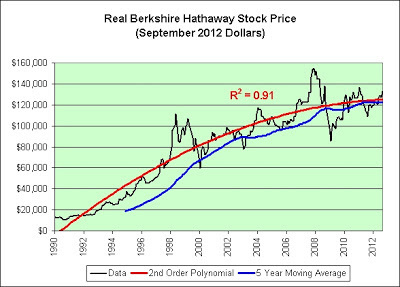 The following chart shows Berkshire Hathaway stock adjusted for inflation. This is not a prediction. As a follower of trend failures and a believer in slowing growth theories, I simply ask a serious question. Peak Warren Buffett? 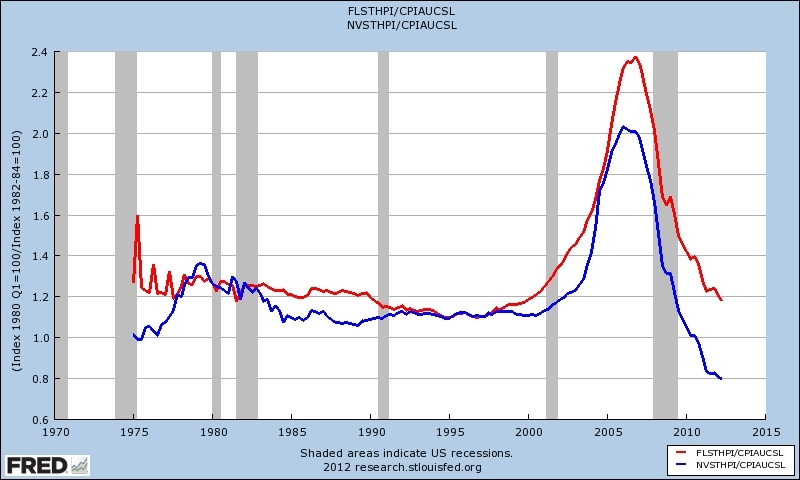 The following chart shows the All-Transactions House Price Index for each state divided by the Consumer Price Index. And the winner is... Florida! "Distant inflation expectations from the TIPS (Treasury inflation protected securities) market seem to suggest that investors do not completely trust the Fed to deliver on its 2 percent inflation target." If the bond market doesn't trust the Fed then what does it trust? Ah, yes. It's the rear view mirror. 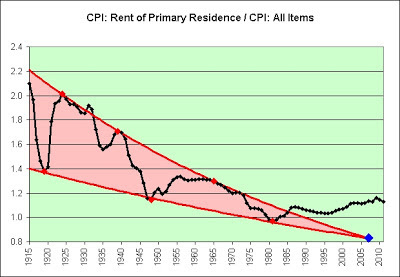 As seen in the black line on the chart, the average inflation rate from September 1992 to September 2012 was 2.50%. The derived inflation rate using today's 2.55% yield on the 20-year nominal treasury and subtracting off today's 0.01% real yield on the 20-year TIPS gives us an average annual inflation expectation of 2.54% over the next 20 years. That is shown as the blue diamond on the chart. What does this mean? The bond market expects the last 20 years to repeat. Maybe it will. Maybe it won't. In any event, this does not imply that the bond market is smarter than the stock market. Both markets apparently love staring into the rear view mirror. I can't say that I can come up with a better guess for what inflation will do over the next 20 years. I'm really torn most days. My gut says 2.5% is probably a fairly good guess. Higher? Lower? Who really knows for sure? In general, this is why I prefer treasuries with inflation protection over those without it though. It's just one less thing I need to gamble on. Hey, at least it isn't an exponential trend failure. That's something I guess. As of today's price of $2.53, the stock's lost an additional 40%. Another pocket of investors who should consider panicking are the ones who bought up shares of beleaguered companies they misinterpreted as "cheap." Many of these folks probably missed the point that much of the time, such stocks are cheap for a very, very good reason, especially when the economy's in fragile condition. 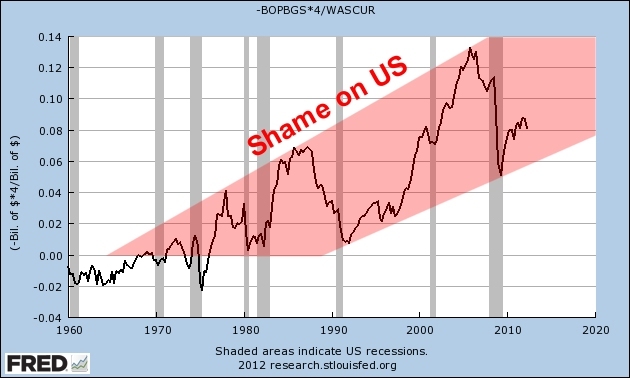 Anyone who spun the wheel on RadioShack (NYSE: RSH ) should be rethinking the wisdom of having bought in right about now. If Best Buy's (NYSE: BBY ) in dire straits, how on earth is RadioShack going to improve its competitive standing? "Las Vegas is now the No. 1 brand throughout the country," he said. "And what has been done here should make this an example for (other communities in) the country and the world." The permabulls anxiously await a rebound in economic activity. The permabears nervously await a rebound in economic activity. 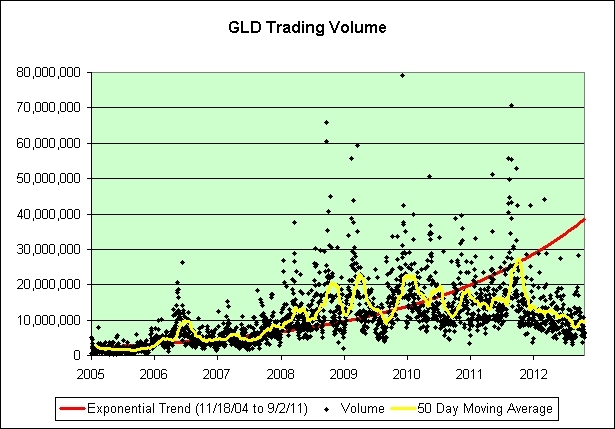 Disclosure: As of 2004, I'm a permabear. What can I say? I like to plan early. In 1979 Chrysler suffered a loss of $1.1 billion. 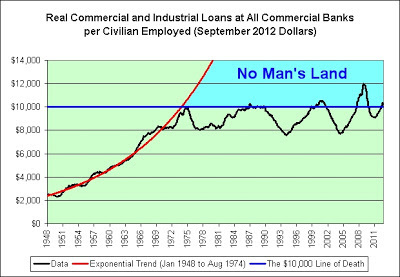 That year the corporation requested aid from the government. In 1980 the Chrysler Loan Guarantee Act was passed, which provided $1.5 billion in loans to rescue Chrysler from insolvency. In addition, the government's aid was to be matched by U.S. and foreign banks. 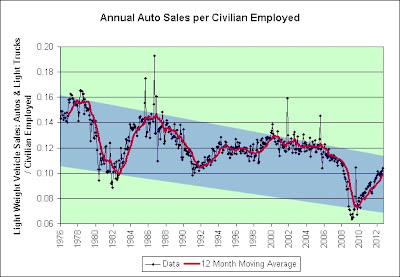 In late September 2008, Congress approved a more than $630 billion spending bill, which included a measure for $25 billion in loans to the auto industry. These low-interest loans are intended to aid the industry in its push to build more fuel-efficient, environmentally-friendly vehicles. The Detroit 3 -- General Motors, Ford and Chrysler -- will be the primary beneficiaries. Simple extrapolation suggests that these things happen every 29 years. 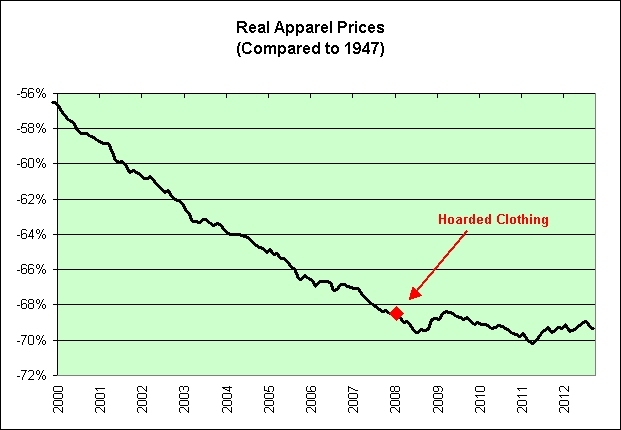 If real apparel prices fall as we move our textile jobs overseas, then the real price of something else must rise to take its place. This post was inspired by the comments found here. 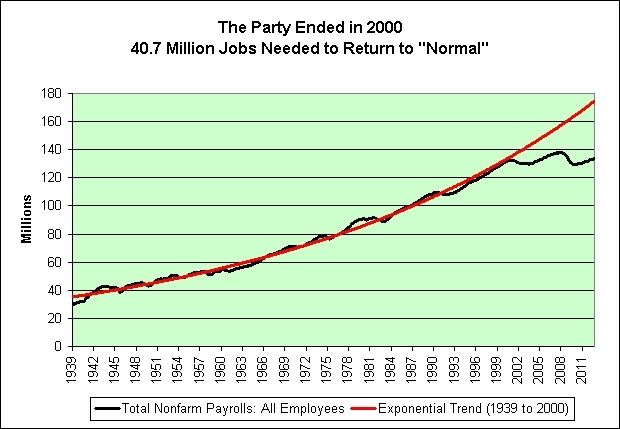 These jobs will never come back. 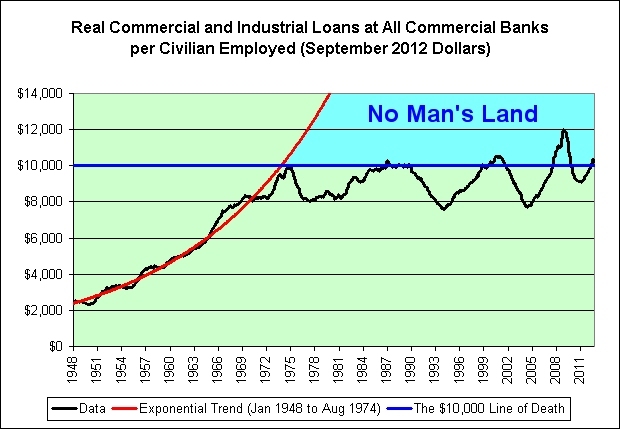 No man's land is a term for land that is unoccupied or is under dispute between parties that leave it unoccupied due to fear or uncertainty. The term was originally used to define a contested territory or a dumping ground for refuse between fiefdoms. It is most commonly associated with the First World War to describe the area of land between two enemy trenches to which neither side wished to move openly or to seize due to fear of being attacked by the enemy in the process. 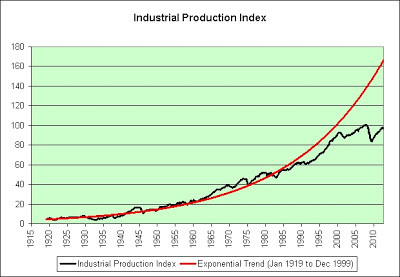 Is it just me or does this chart have an ominous look about it? This post inspired from the comments of this post. (Reuters) - While inflation has been tame in recent years, there are few forecasters who believe it will remain so in the future. I have to tell you. I love opinions stated as facts. Always have, always will. The bond market expects inflation to average 2.52% per year over the next 30 years (today's 30-year nominal 2.94% minus today's 30-year TIPS 0.42%). Perhaps the bond market is somewhat biased by the Federal Reserve Board setting a long-term inflation target of 2%. I am not suggesting that hindsight will be kind to the bond market's predictions, but I am suggesting that more than a few investors believe that the bond market is right. For what it is worth, I am relatively indifferent. Treasury Inflation-Protected Securities (TIPS), are the natural choice, but they are linked to the flawed Consumer Price Index (CPI). Ah, yes. 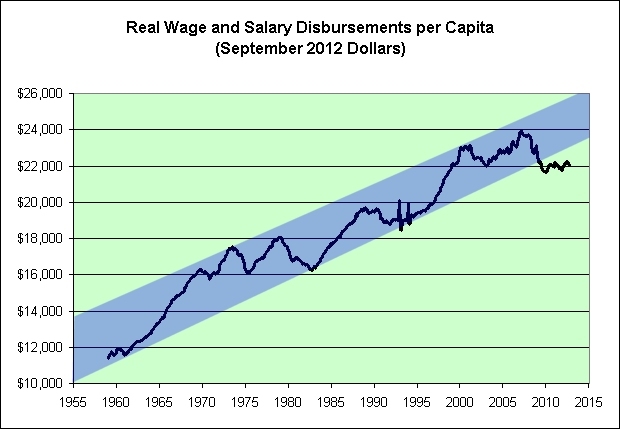 We're back to the flawed CPI argument again. It is certainly very popular these days. 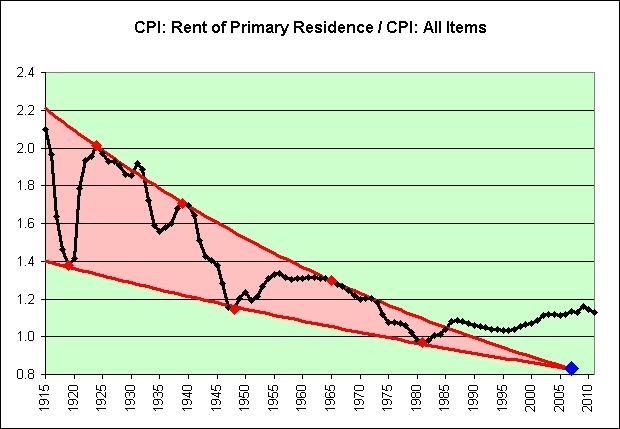 Everyone loves to complain about the CPI. Many seem to even think that it doesn't include food and energy. Kudos to the author for bringing this subject up. Let's just keep picking at the wound. I love it! 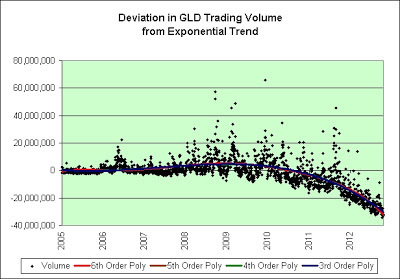 A blended portfolio that employs a number of inflation beaters is the best approach. 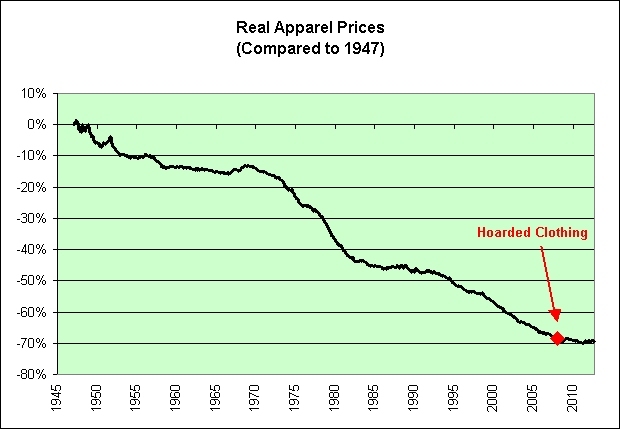 We're now past inflation hedges and well into inflation beaters? Excellent! 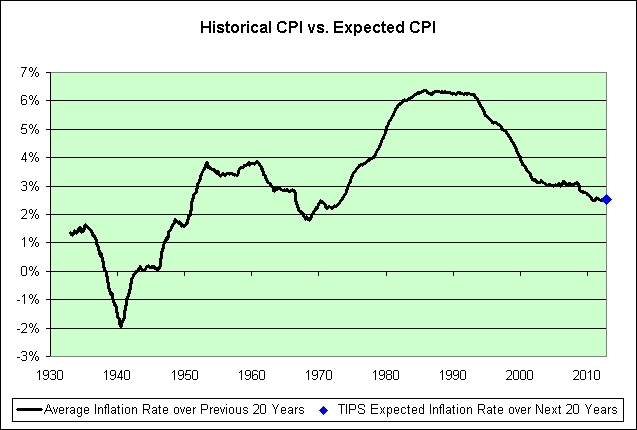 Clearly if we can come up with a complete set of inflation beaters then we can protect ourselves against inflation. Why didn't I think of that? Genius! In 1966, Alan Greenspan stated that there can be no safe store of value in a welfare state. This author is single-handedly proving him wrong! He's not just got one thing that can safely store value, he's got a number of them! Further, if we use his set of "sure thing" inflation beaters then perhaps we should borrow money and leverage up our "sure thing" bets! Right? 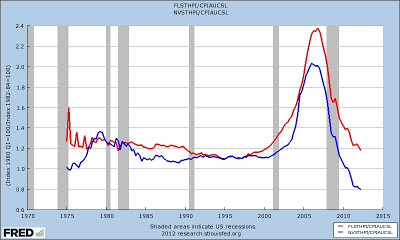 We'll not only squeeze all that inflation risk from our portfolios but we'll make out like filthy rich bandits too! Why hasn't anyone tried this before? Genius! TIPS gain in value when inflation is rising, but are an imperfect gauge of prices. This is a fact. If we hyperinflate then TIPS will be worth an amazing amount. 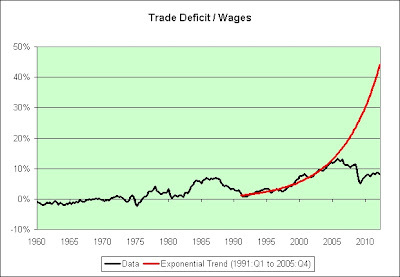 We just need to ignore the enormous taxes on the inflationary gains that will financially ruin us. I had a point here. I forgot what it was. Pay no heed. TIPS gain in value when inflation is rising! That's what it says and who am I to argue differently? Further, there has been an ungodly amount of inflation since 2000. 2.4% per year! 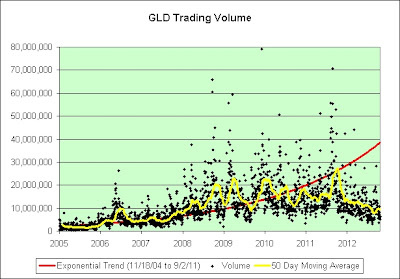 That's why long-term TIPS and I-Bonds bought in 2000 are worth so much now! Inflation is raging out of control! 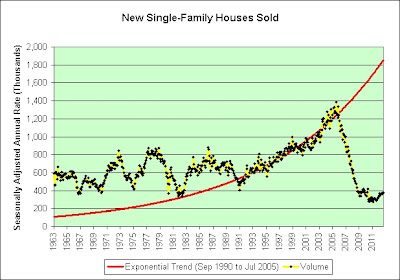 It has nothing to do with deflating long-term stocks and deflating long-term housing prices (as primary mainstream investments). Rest assured of that. While TIPS are an imprecise, though less-volatile, tracker of the cost of living, they move in the opposite direction of stocks. Absolutely. 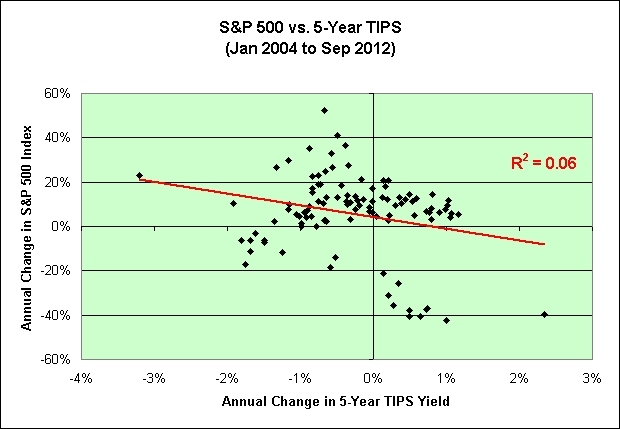 Just look at how TIPS performed when stocks crashed during that deflationary crash in 2008. Oops. 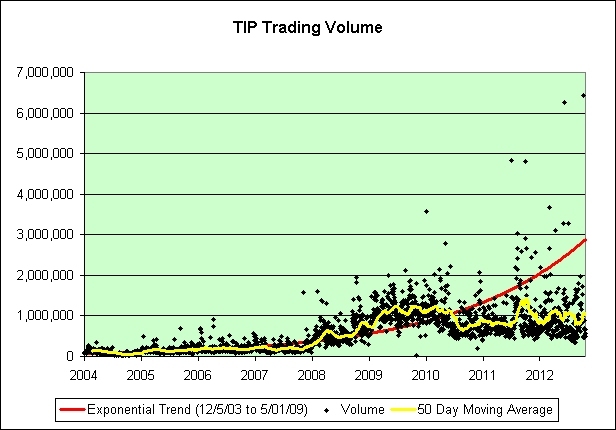 Also note how TIPS and stocks have both performed since that crash. Oops again. Bad examples. As I have stated previously within this post, I always love opinions stated as facts. I'm therefore going to have to love this too. He's got an opinion and by God I'm going to make it work! I'm no hypocrite! Let's try it again using hard science. Yes! Never mind that extremely weak correlation of just 0.06! As stocks rise, TIPS yields fall! Oh, wait. TIPS bonds go up in value as the real yields fall. I suppose I should factor that in. I guess I just can't see the correlation he sees. If anything, the correlation goes in the other direction. Oh, well. Can't say I didn't try to throw his opinion a bone here though. The author is a Reuters columnist and the opinions expressed are his own. Now that is something I can truly believe. He won't be a columnist for long though. He's got the stock and bond markets completely figured out. Watch out Warren Buffett! He's coming for you and he's bringing his readers with him. In all seriousness, it's pet peeve city again. I apologize for the outburst, lol. Sigh. Disclaimer: I've got a head cold and am under the influence of NyQuil. 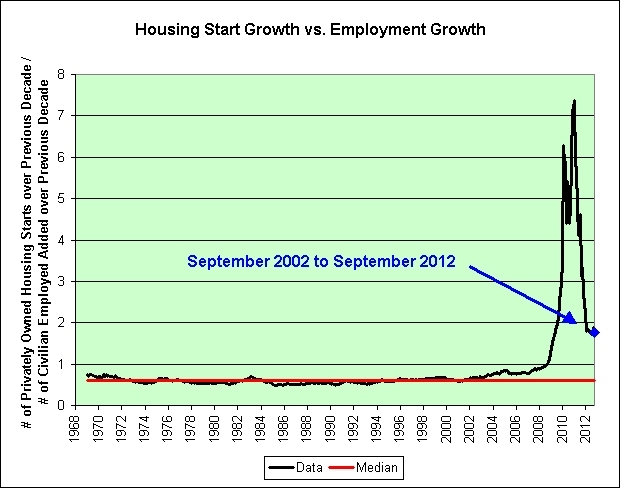 Perhaps it is sympathy pain for reading mainstream media's take on our economy. It is certainly possible. 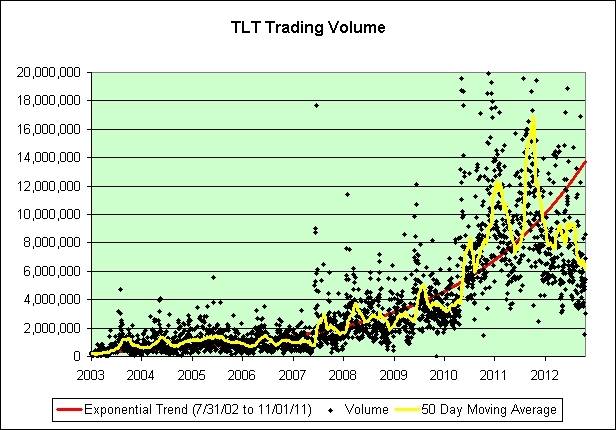 There were quite a few charts within this post and I've been asked (by Jeff) if I would update them. Here you go! 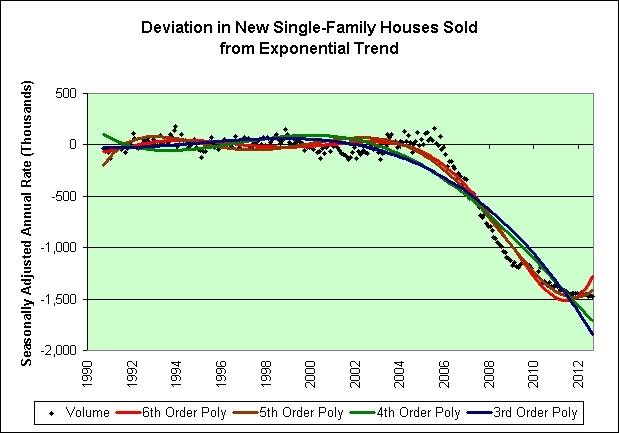 I'm not even going to remotely suggest that I can accurately predict the future with 2nd order polynomials. However, it does allow me to pose a serious question. We're back to extreme danger. 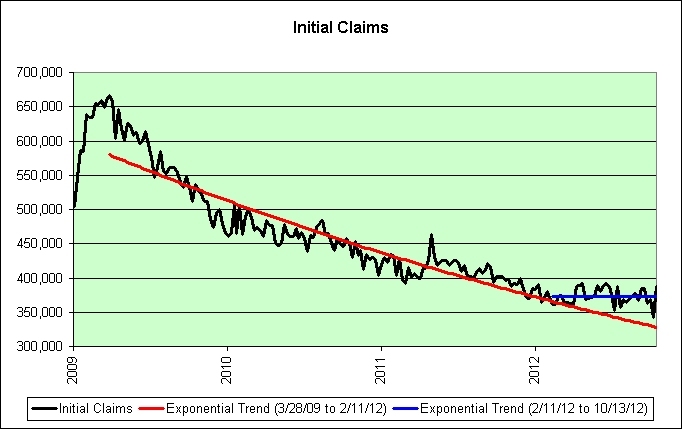 The healthy red trend line continues to drift away. That's 66 straight weeks of upward revisions. My count was off. It's 68 actually straight weeks. Here is a fresh update of the charts. As a side note, I bought 40 pairs of hiking socks at Costco this week. Call me crazy if you must. I figure it will probably meet or beat the return on 3-month treasury bills going forward. That's all. It isn't because I think we're about to hyperinflate. 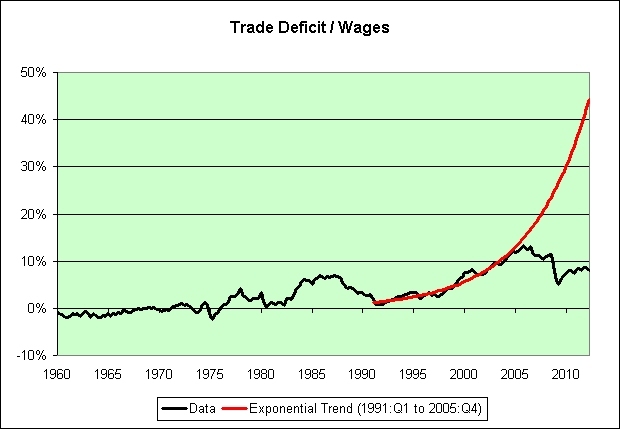 The following chart shows our trade deficit as a fraction of our wages. Here's another way to look at that same data. 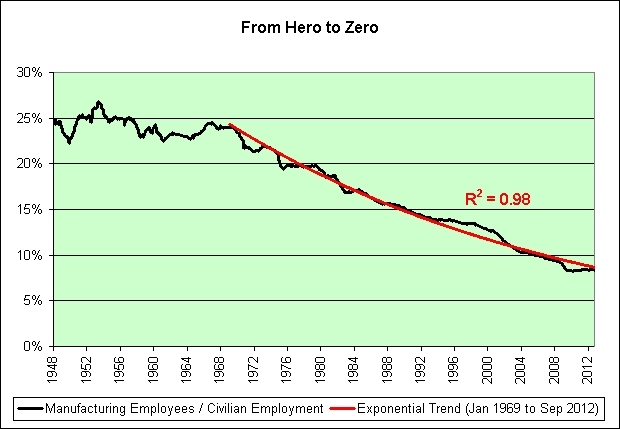 Exponential trend failure? Big shocker. Based on today's 1.83% 10-year treasury yield, the belief that we are still in crisis mode, and the assumption that yields won't change much between now and November 1st, I am predicting a fixed rate of 0.4%. 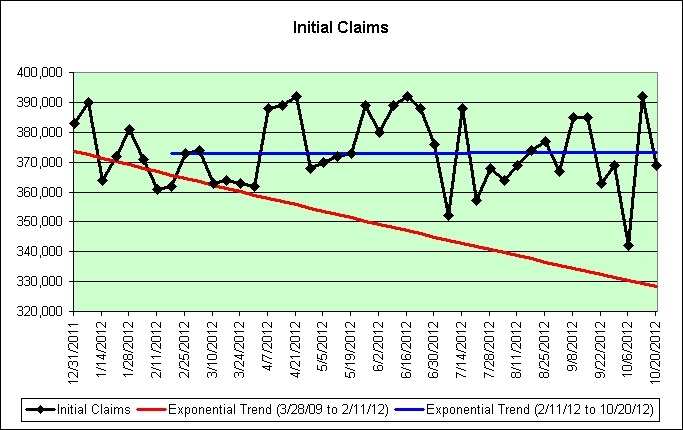 The following chart shows my reasoning. I also expect the original term to be increased at some point. 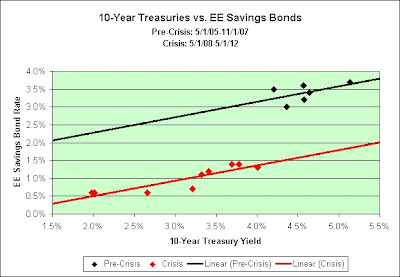 EE Savings Bonds yield 3.53% if held 20 years (since they are currently guaranteed to double in 20 years). This is far more than the current 2.60% yield on the 20-year Treasury. 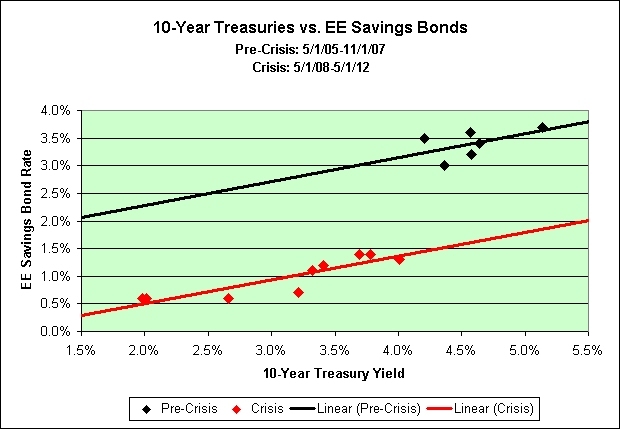 As it stands now, EE Savings Bonds are an extreme bargain compared to the 20-year Treasury. I can't say they will be an extreme bargain compared to hoarded toilet paper though. We won't know for 20 years. 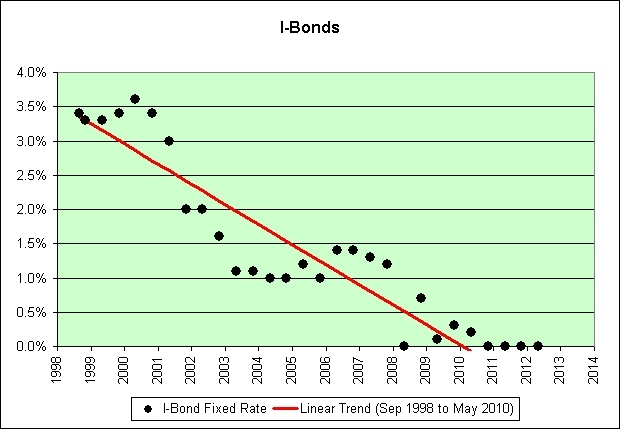 I prefer I-Bonds, but will also be a reluctant buyer of EE Bonds in January (again) if the original term is not modified. We'll know on November 1st. 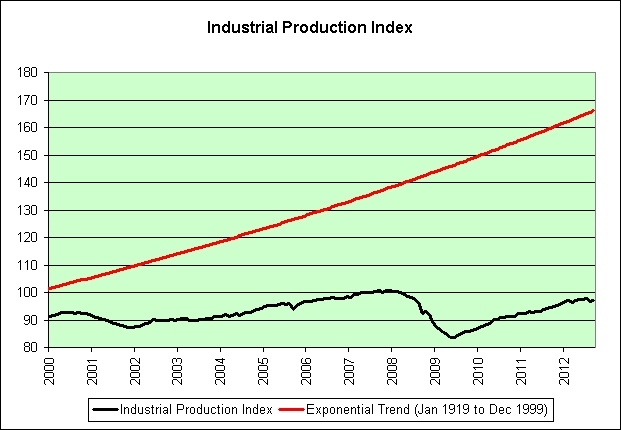 Anonymous pointed out that my industrial production chart looked a lot like my Real GDP chart. It does! Here's a new version that breaks the growth into two distinct periods (or even three depending on how you look at it). 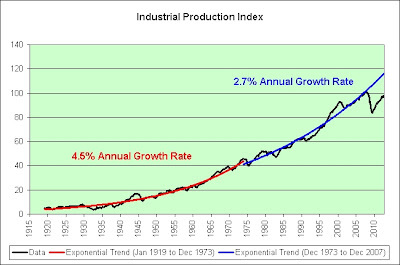 If the 1973 oil crisis permanently helped knock 1.8% off of our long-term industrial production growth, then one wonders if the 2008 oil crisis permanently helped knock off another 1.8%. Put another way, who honestly thinks that we will return to the blue trend line? Step right up, ladies and gentlemen! Everyone's a winner! Behind these curtains lies one of the nation's oldest exponential trend failures. 80 years in the making! $1,000 reward if not absolutely real! Deemed too strong for women and children! Bargains galore! Pay no heed to the dog and pony sideshow! There has never been a better time to get rich quick! Learn the secrets inside! Gaze in wonder at the two-headed returns! 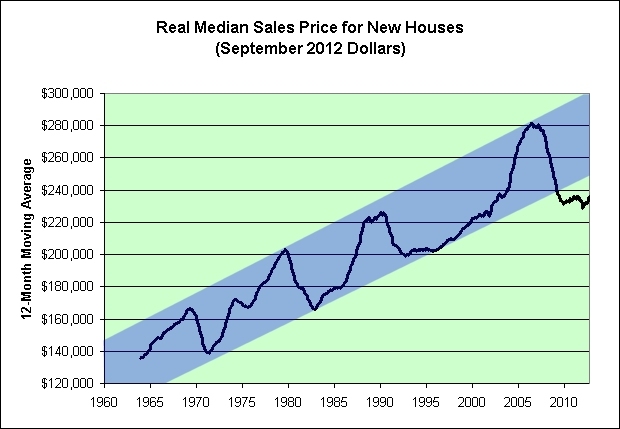 I'm predicting a fixed rate of 0.0% and a composite rate of 1.76%. 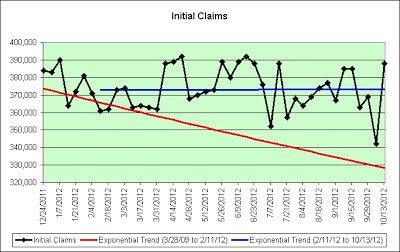 In March 2012 the CPI-U was 229.392. 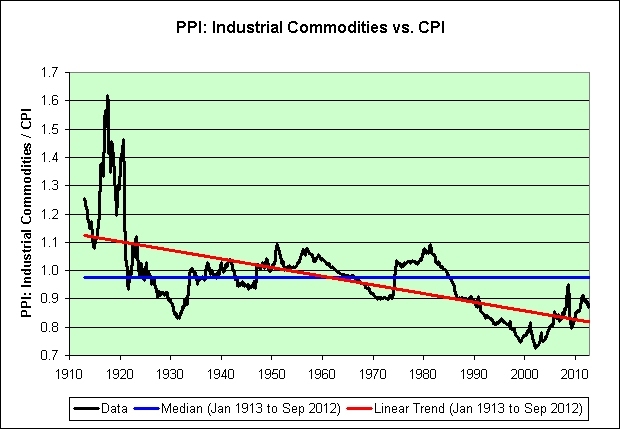 In September 2012 the CPI-U was 231.407. 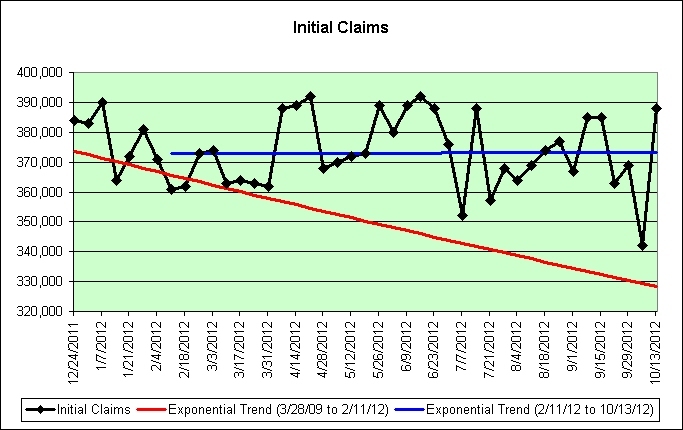 That's a 0.878% increase over the six month period. Inflation has been fairly tame. 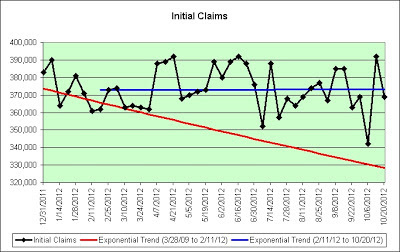 As seen in the following chart, predicting the 0.0% fixed rate just keeps getting easier and easier. The government would definitely set the rate below zero if it thought it could do so (without waking more than a few out of their blissful illusion of prosperity slumber). It's not that easy though. 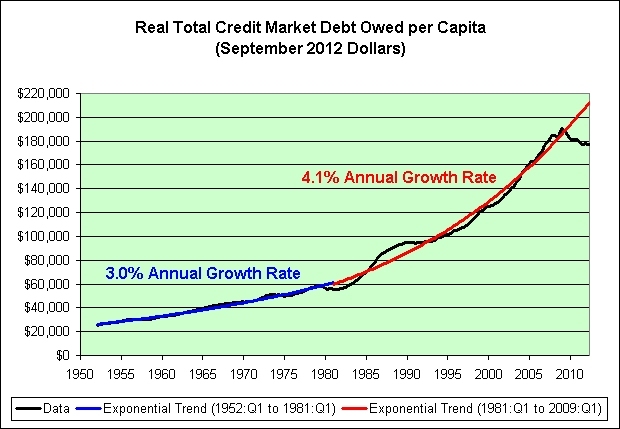 "The fixed rate will always be greater than or equal to 0.00%." That's what the government has said. 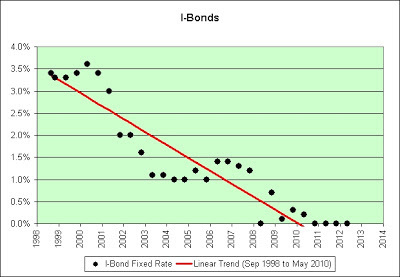 Since lowering the rate isn't too likely, the powers that be simply reduced how many I-Bonds we can buy. You know, to refocus the program on small investors. 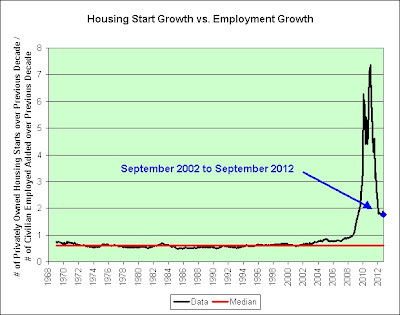 Funny how that was the very month the great recession began. One might even say hilarious, lol. Sigh. 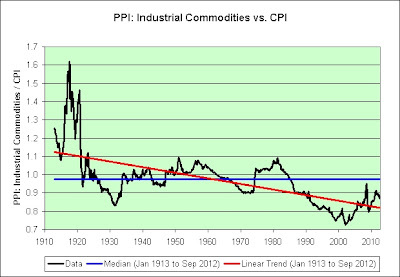 The following chart shows the producer price index for industrial commodities divided by the consumer price index. 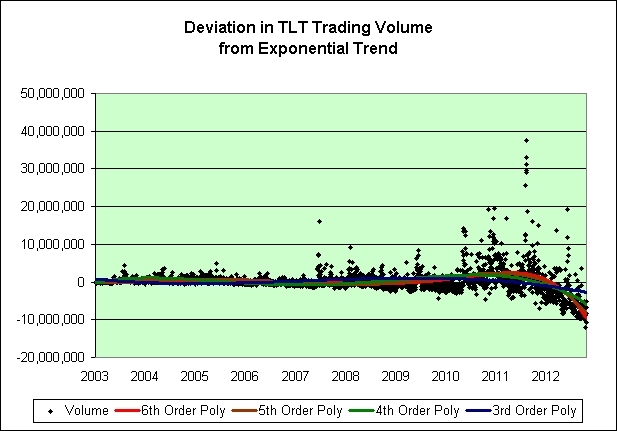 If you are a believer in return to trend line and/or return to median theories then you have a tough decision to make. Which line will we be returning to? 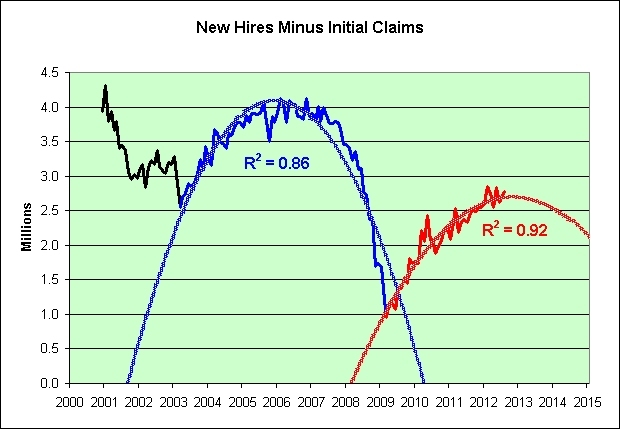 On the one hand, our monetary policy would support returning to the blue trend line. 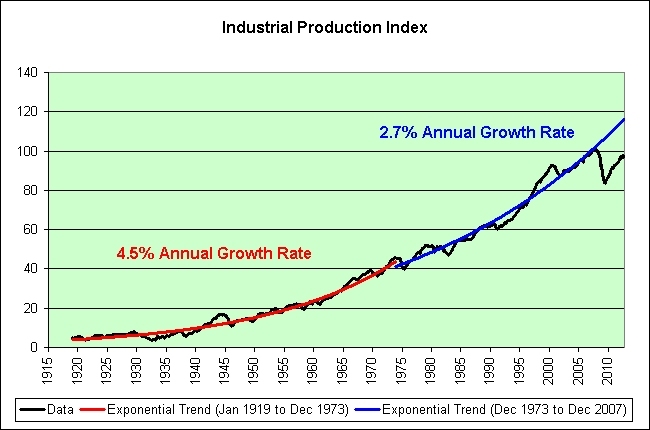 On the other hand, I'm not a believer in China's economic miracle story (nor have I been). Returning to the red trend line is therefore hardly out of the question. There's not just a glut of dollars; there's also a glut of stuff. Perhaps there is a balance that is between the two lines. In fact, that is where we find ourselves today. 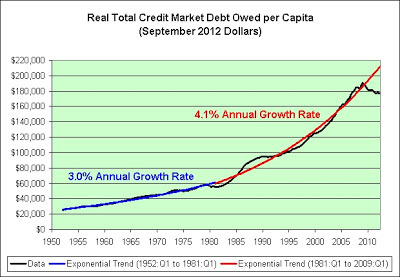 Let me zoom in a bit and add some new exponential growth trend lines. We were on a highly correlated exponential trend in blue but then it failed (rather spectacularly). 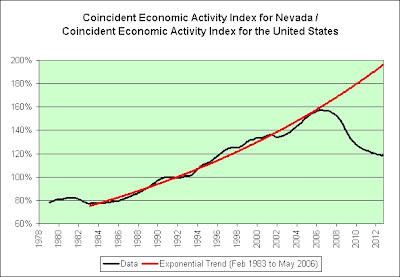 Now we're on a less correlated exponential trend line in red. When will it fail? Has it already failed and we're just waiting for more confirmation? 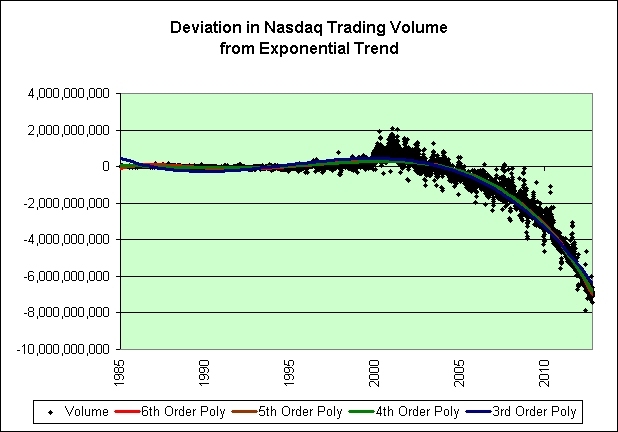 All exponential trends eventually fail. The timing can be incredibly difficult to predict though. It won't do us any good to bet against it if it fails long after we're dead and buried. 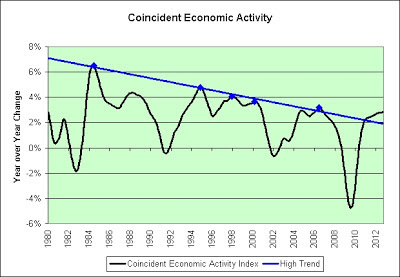 As seen in the chart, the trend over the past year has actually been down, much to the dismay of the hyperinflationists. I, for one, am not complaining. Since there have probably not been enormous advancements in Calculus since I graduated in 1987, I'm guessing there must be another reason for the price increases. In the spirit of Halloween, here's my theory. 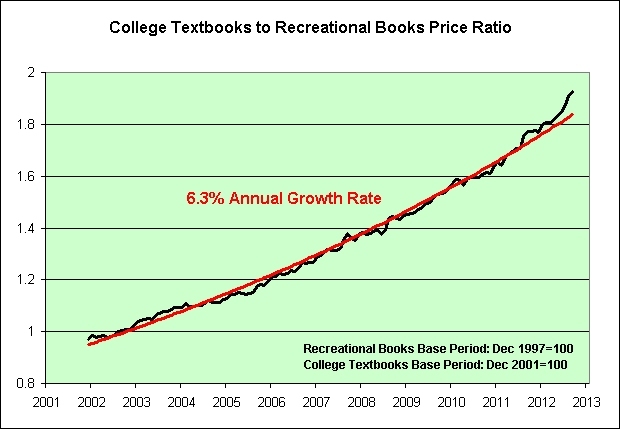 We've run out of modern college textbooks and are now relying on ancient books bound in human skin and written in blood. It's all about supply and demand! The source of all the trouble is an ancient book bound in human skin and written in blood. "Many young consumers impacted by the financial crisis are still struggling," he said.